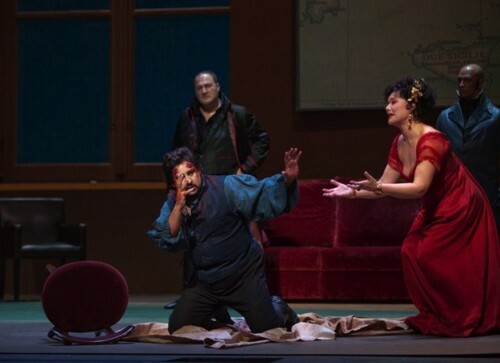 Tosca (October 10) with Gorge Gagnidze as Scarpia (back left), Marcelo Alvarez as Cavaradossi (front left) and Karita Mattila in te title role. Ken Howard-Metropolitan Opera photo. 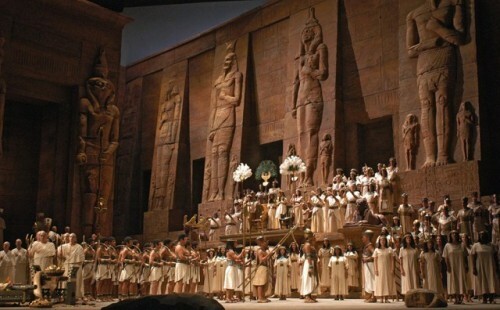 The triumphal scene from Act Ii, Scene 2 of Verdi’s Aida (October 24). Photo by Maary Sohn-Metropolitan Opera. Turandot Act 3 (November 7) with Richard Margison as Calaf, Andera Gruber as Turandot and Charls Anthony as the Emporor. Photo: Beatriz Schiller-Metropolitan Opera. Les Contes d’Hoffman (December19) features Joseph Calleja as Hoffman. Photo: Micaela Rossato-Metropolitan Opera. 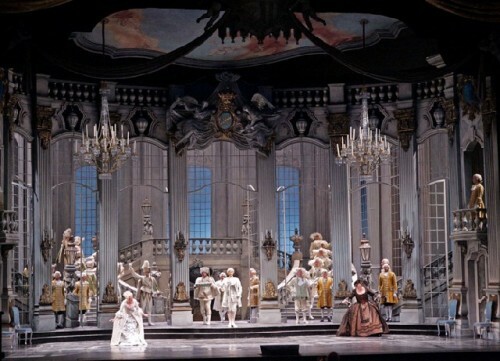 Der Rosenkavalier (January 9) Act II of the Strauss opera in a photo by Ken Howard-Metropolitan Opera. Bizet’s Carmen (January 16) with Elina Garanca in the title role. Photo: Gunars Janaitis-Latvian National Opera. 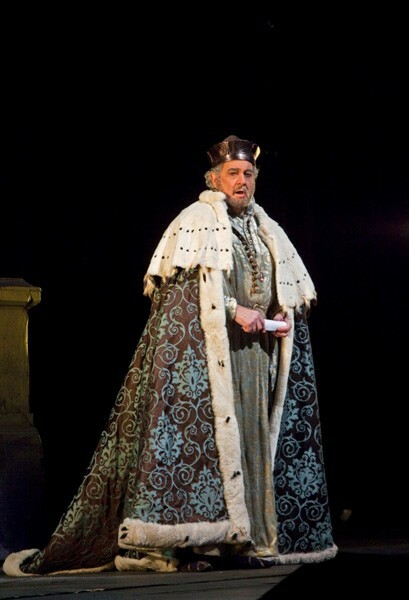 Simon Boccanegra (February 6) with Placido Domingo in the title role. Photo: Ken Howard-Metropolitan Opera. Hamlet (March 27) Natalie Dessay as Ophelie and Simon Kenlyside in the title role of Thomas’s Hamlet. Covent Garden Production Photo: Catherine Ashmore. Armida (May 1) Renee Fleming sings the title role of this lesser known Rossini opera. Photo: Dusan Reljin-Metropolitan Opera. Renee Fleming is both host and singer during the season. Perhaps no fans are more devoted to their music than opera lovers. It is the most spectacular art form of them all. It combines the majesty of a symphonic orchestra with singing of the highest order, filling enormous stages with posh costumes and lush scenery. It employs the leading musicians, designers and artists of every generation. Oddly, considering all the pomp, pageantry and histrionics, long time opera lovers don't tell their friends they are going to "see" a performance. They go to the opera to "hear" it. It is the music, the singing, above all, that matters most. Opera singers really put out for their audiences. Even without amplification, they are loud even in the last row of the topmost balcony. Since tickets first went on sale a few weeks ago, the first several performances in the 2009-10 telecast season have sold out at the Mahaiwe Performing Arts Center in Great Barrington, though good seats remain for the six productions that follow. Tickets for all performances can be had at other venues in the region, including Memorial Hall, 51 Bridge Street in Shelburne Falls, right on Route 2 near Route 91. This may be an ideal choice for North Berkshire County residents. See our list of the operas and dates below, and an overview of the many venues in the US and beyond following this commentary. 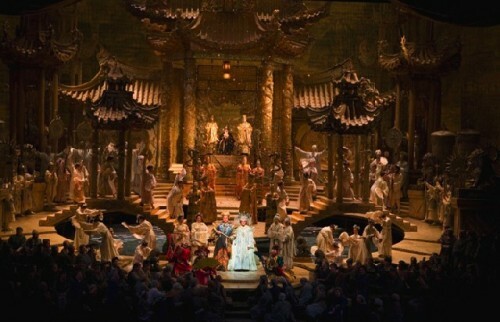 The series of telecasts is an innovation introduced by The Metropolitan Opera's General Manager, Peter Gelb, almost immediately upon his arrival at Lincoln Center. The genial and MacArthur Award-worthy entrepreneur of the arts once toiled with me at the esteemed Boston Symphony Orchestra, but he was a bit ahead of his time, moving on to greater challenges. In an odd coincidence, we both began as ushers and rose up through various jobs first as a publicity manager, then booking and arts management. He joined Columbia Artists Management after the BSO, then became executive producer for "The Metropolitan Presents" for a half dozen years in the late 80's. In 1993 he became head of Sony Classical Records classical division for the US, and a year later, for the world. He joined The Met in 2006, bringing all that experience with him. He boldly foresaw the future for the Metropolitan Opera's in this ultimately popular, award-winning series of live transmissions in movie theaters around the world. Though let the record show that at first his proposal was met with sarcasm and disbelief by some self-anointed keepers of the opera traditions. Now comes the 2009-10 season, featuring nine live opera transmissions, beginning on Saturday, October 10 at 1:00 p.m. ET with a new production of Puccini's Tosca starring Karita Mattila. 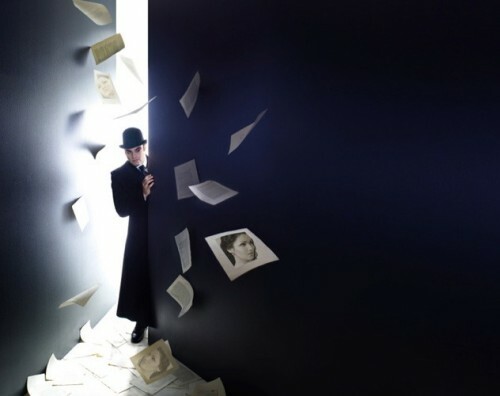 The production, directed by Luc Bondy in his house debut and conducted by Met Music Director James Levine, features Marcelo Álvarez and George Gagnidze in the other leading roles. More than 900 theaters in 42 countries around the world are participating. It is entirely possible that the record number of 1.8 million tickets sold last year will be topped this season. Four other new productions are featured in the series, including Offenbach's Les Contes d'Hoffmann starring Joseph Calleja in the title role, with Anna Netrebko and Alan Held; Bizet's Carmen starring ElÄ«na GaranÄa and Roberto Alagna; Natalie Dessay and Simon Keenlyside in Thomas's Hamlet; and Rossini's Armida starring Renée Fleming. The HD season also includes Verdi's Aida with Violeta Urmana, Dolora Zajick, and Johan Botha; Maria Guleghina and Marcello Giordani in Puccini's Turandot; Richard Strauss's Der Rosenkavalier with Fleming and Susan Graham; and Verdi's Simon Boccanegra starring Plácido Domingo, singing the title role for the first time at the Met. James Levine leads four of the HD transmissions. Complete casting and details of the season's Live in HD performances follows below. All nine high-definition productions will be shown live worldwide on Saturdays through May 1 with most encore presentations in the United States shown on Wednesdays, 18 days after the live exhibition. Ticket sales are already underway. For additional information on other locations and tickets, visit The Met Opera or call 1-800-Met-Opera (1-800-638-6737). TOSCA Saturday, October 10, 2009 (1:00 p.m. EDT / 12:00 p.m. CDT / 11:00 a.m. MDT / 10:00 a.m. PDT/ 17:00 p.m. UTC / 18:00 p.m. BST / 19:00 CEST) Â– A new production of Puccini's Tosca by Luc Bondy in his house debut, starring Karita Mattila in her first performance of the title role outside her native Finland, and Marcelo Álvarez as Cavaradossi. George Gagnidze sings the role of Scarpia. James Levine conducts. TURANDOT Saturday, November 7, 2009 (1:00 p.m. EST / 12:00 p.m. CST / 11:00 a.m. MST / 10:00 a.m. PST/ 18:00 p.m. UTC / 19:00 CET) Â– Franco Zeffirelli's classic production of Puccini's Turandot features the Met role debuts of Maria Guleghina in the title role, Marcello Giordani as Calàf, Samuel Ramey as Timur, and Marina Poplavskaya as Liù. Conductor Andris Nelsons makes his Met debut. LES CONTES D'HOFFMANN Saturday, December 19, 2009 (1:00 p.m. EST / 12:00 p.m. CST / 11:00 a.m. MST / 10:00 a.m. PST/ 18:00 p.m. UTC / 19:00 CET) Â– Bartlett Sher, whose staging of Rossini's Il Barbiere di Siviglia was a hit two seasons ago, returns to direct his second Met production: Offenbach's Les Contes d'Hoffmann, conducted by James Levine. Joseph Calleja stars as Hoffmann, with Anna Netrebko as Antonia, Ekaterina Gubanova as Giulietta, Kate Lindsey as Nicklausse, Kathleen Kim as Olympia, and Alan Held as the four villains. The Met: Live in HD series, produced in association with PBS and WNET.org, is seen on public television as part of Great Performances from the Met; a number of these performances are also seen on international television. The Met: Live in HD began airing on PBS in March 2008, and nine of these HD performances are now available on DVD. The most recent, The Magic Flute, was released by the Met and is available at the newly renovated Met Opera Shop in the opera house lobby. Archival videos of Otello and Cavalleria Rusticana/Pagliacci from 1978 have also recently been issued on the Met's label and are available at the Opera Shop, online at www.metoperashop.org, and through other outlets. Many of the HD performances can also be seen on Met Player, the company's online streaming subscription service that makes the Met's extensive video and audio catalog of full-length performances available to the public for the first time online and in exceptional, state-of-the-art quality. The Live in HD series was recently honored with a prestigious 2008 Peabody Award for its "vividly designed, smartly annotated productions of Hansel and Gretel, Doctor Atomic, Peter Grimes and other operas. The Met used state-of-the-art digital technology to reinvent presentation of a classic art form." The Met won a special Emmy Award in January 2009 for "advancing technology through ongoing, live, global transmission of high-definition programming to movie theaters." The Met's Live in HD series will reach more than 470 theaters in the U.S. through a renewed partnership with National CineMedia and its NCM Fathom alternative entertainment division. The series will be transmitted to select including transmissions in AMC Entertainment Inc., Celebration! Cinema, Cinemark Holdings, Inc., Clearview Cinemas, Cobb Theatres, Georgia Theatre Company, Goodrich Quality Theatres Inc., Hollywood Theaters, Kerasotes Showplace Theatres, Loeks Theatres, Malco Theatres, Marcus Theatres, National Amusements Inc., Regal Entertainment Group, and various independent movie theaters. Up to 100 theaters in Canada will participate through a renewed partnership with Cineplex Entertainment, with locations in Canada's Atlantic Provinces participating through a renewed partnership with Empire Theatres. Locations in Puerto Rico are made possible through Caribbean Cinemas. Participating Independent Cinemas, Performing Arts Organizations, and Colleges in the U.S. The Lark Theater (Larkspur, CA); Arena Theatre (Point Arena, CA); Arlington Theatre (Santa Barbara, CA); Music Academy of the West (Santa Barbara, CA); Rialto Cinemas Lakeside (Santa Rosa, CA); Michael D. Palm Theater (Telluride, CO); Fairfield University (Fairfield, CT); RC Theatres Oceanwalk (Daytona Beach, FL); Quick Center for the Performing Arts, Society of the Four Arts (Palm Beach, FL); Cinemaworld Majestic (Vero Beach, FL); Douglass Theatre (Macon, GA); the Russel E. and Fern M. Hettenhausen Center for the Arts, McKendree College (Lebanon, IL); the Browning Cinema, Marie P. DeBartolo Center for the Performing Arts, University of Notre Dame (Notre Dame, IN). Also The Cape Cinema Group (Dennis, MA); The Mahaiwe Performing Arts Center (Great Barrington, MA); Memorial Hall Theater (Shelburne Falls, MA); Wellfleet Harbor Actors Theater (Wellfleet, MA); Lincoln Theater (Damariscotta, ME); The Grand (Ellsworth, ME); Strand Theater (Rockland, ME); State Theater (Traverse City, MI); Saint Louis Art Museum (St. Louis, MO); Mary Riepma Ross Media Arts Center at Hixon-Lied College of Fine and Performing Arts, University of Nebraska-Lincoln (Lincoln, NE), Film Streams Inc. (Omaha, NE), Hopkins Center for the Arts, Dartmouth College (Hanover, NH); Music Hall (Portsmouth, NH); Monmouth University (West Long Branch, NJ); The Lensic Performing Arts Center (Santa Fe, NM). Also Time and Space LTD (Hudson, NY); Brooklyn Academy of Music's Rose Cinemas (Brooklyn, NY); Sullivan County Community College (Loch Sheldrake, NY); Lincoln Center's Walter Reade Theater (New York, NY); The Crane School of Music, SUNY Potsdam (Potsdam, NY); Staller Center for the Arts/SUNY Stonybrook (Stonybrook, NY), Oregon Coast Arts (Newport, OR); Mary D'Angelo Performing Arts Center, Mercyhurst College (Erie, PA); The Majestic Theater at Gettysburg College (Gettysburg, PA); Penn Cinema (Lititz, PA), RC Theatres Reading Movies and Imax (Reading, PA); State Theatre (State College, PA); The Paramount Theater (Charlottesville, VA), and The Rose Theater (Townsend, WA). Joining the Live in HD theaters this season are: Rural Arts and Media Project (Mariposa, CA); Katharine Hepburn Cultural Arts Center (Old Saybrook, CT); Leura Hill Eastman Performing Arts Center (Fryeburg, ME); Collins Center for the Arts, University of Maine (Orono, ME), Roxy Theater (Missoula, MT); Sunrise Theater (Southern Pines, NC); Capitol Center for the Arts (Concord, NH); Peterborough Players (Peterborough, NH); Ulster Performing Arts Center (Kingston, NY); Bardavon (Poughkeepsie, NY); Allentown Symphony (Allentown, PA); Catamount Film Company (St. Johnsbury, VT); and Lincoln Theatre (Mt. Vernon, WA). The Met: Live in HD has expanded its distribution in the 2009-10 season to include 42 countries. New countries joining the Live in HD network this season include Bulgaria, Chile, Lithuania, Malta, Slovakia, Slovenia, South Korea, and Uruguay. The Met: Live in HD returns in the following locations: Argentina (Fundacion Beethoven), Australia (presented by Sharmill Films), Austria (presented by ClasArt), Belgium (Kinepolis), Brazil (Movie MBZ), Colombia (Cine Colombia), Costa Rica (Centro Cultural), Croatia (presented by Aero Films), the Czech Republic (presented by Aero Films), Denmark (Nordisk Film Biografer); Estonia (Forum Cinemas), Finland (Finnkino), France (presented by CielEcran), Germany (presented by ClasArt). Also Hungary (presented by Aero Films), Iceland (Sam Films), Ireland (presented by Opera Ireland), Japan (Shochiku), Latvia (Forum Cinemas), Luxembourg (Utopia), Mexico (Auditorio Nacional), the Netherlands (Pathé, CineMec Ede, and Foroxity Film Arena), New Zealand (Rialto Distribution), Norway (Bergen Kino, Oslo Kino and Tromsø Film Festival), Peru (Radio Filharmonia), Poland (Arthur Rubenstein Philharmonic and Aero Films), Romania (presented by Aero Films), Sweden (FHP Sweden), Switzerland (CielEcran), South Africa (Ster Kinekor Theatres), the United Kingdom (City Screen/Picturehouse), and several UK independent movie theaters and performing arts organizations. The Met: Live in HD series is made possible by a generous grant from the Neubauer Family Foundation. Bloomberg L.P. is the global corporate sponsor of The Met: Live in HD. The HD broadcasts are supported by Toll Brothers, America's luxury home builder®. "I wish that you had a showing in Granada or Malaga, Spain! ! ! Your HD has added an entirely new dimension t my life! ! ! "